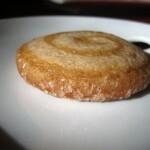 This recipe is modified slightly from the “Chai Spiral Cookies” recipe from the Pampered Chef “Simply Sweet” cookbook. I just wanted my cookies to be a little spicier. If you want the original recipe, find your nearest Pampered Chef rep and buy this great cookbook right away. 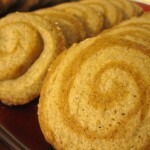 Making this recipe is reminds me very much of how I made my recipe for pumpkin cream cheese rolls. This recipe yields about 30 cookies depending on how thick you slice yours. 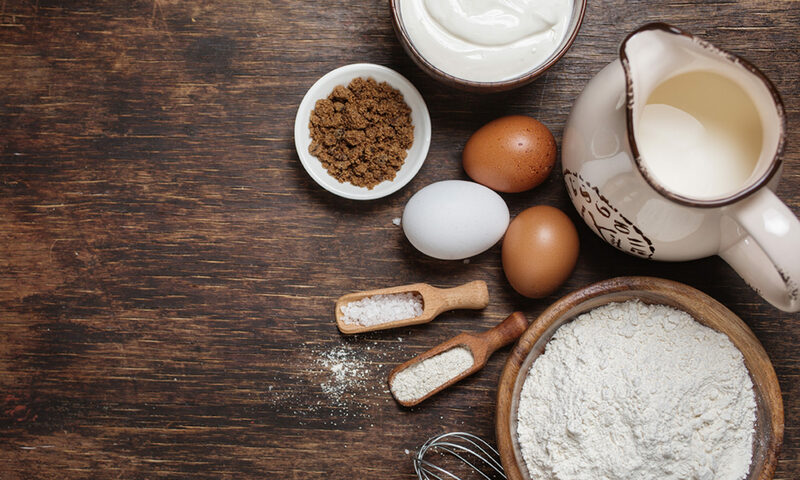 In a mixing bowl, mix together the flour, baking powder, spices and salt. In a separate bowl, beat the softened butter and sugar together until they are creamy. Add the egg and vanilla, and beat until the the mixture is light and fluffy. Add the dry ingredients mixture in parts, mixing on a lighter speed just until blended. Split the cookie batter in half. Leave one half untouched. 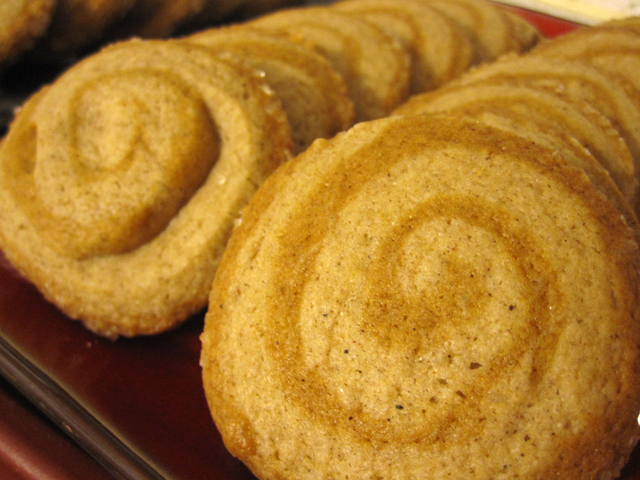 To the other half, add the molasses and additional few tablespoons of flour. Cover and refrigerate both sets of dough for about a half hour. Roll out both doughs using a floured rolling pin. Put the un-molassesed layer on top of the darker layer of dough. Roll it up from the long end into a long, tight roll. Roll the log in the coarse decorating sugar, wrap it up in parchment paper and toss it in the fridge for a couple hours. Preheat the oven to 350 degrees, line your baking sheet with parchment paper, cut into cookie slices of roughly even width and bake each batch about 7 to 9 minutes. Don’t overcook or you’ll end up with too-crunchy cookies! Cool completely on wire cooling racks. 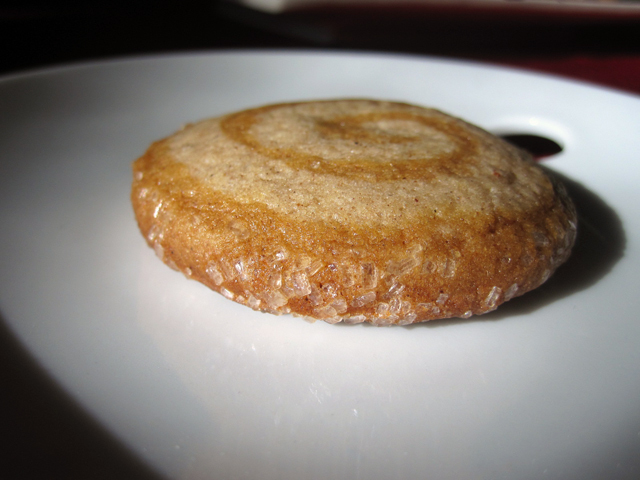 The chai spiced cookies was one of the seven dessert items tasted at the first Fifty-Two Cakes dessert tastings in St. Louis. Here is some of the feedback about the recipe!